Cankermelts-GX uses a patented dissolving time-release disc to provide pin point application of a natural anti-inflammatory directly to the sore. 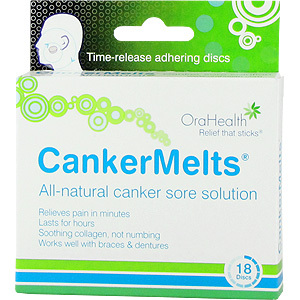 Cankermelts has been shown to heal new canker sores in 1 - 5 days. All natural Cankermelts-GX is the first and olnk canker sore treatment guaranteed to relieve pain and speed healing. The sooner treatment is begun on a new sore, the more quickly the sore will heal. Threatment is most effective when a disc is in place for as many hours per day as possible. When a disc is not in place, the canker sore may grow. Either side of a dry disc will immediately stick to the first wet surface it touches on the inside lining of the mouth. In order to stick to a hard surface such as tooth, gums or braces, the disc must first be placed in the mouth until it softens and them pressed in place for up to one minute. If a disc moves around, it becomes wet and will no longer just stick by itself. You will need to use your tongue, teeth or gums to help hold it in one position for a minute so it can stick. The disc adheres with increasing strength over the first 10 minutes. It will dissolve over 2-6 hours as it provieds continuous medication to the canker sore. As soon as a disc has been dissolved, replace it with a new one. To prevent a relapse, continue to use Cankermelts-GX for 8 hours after you no longer feel the sore. While a Cankermelts disc is in place, the sore is healing. During the hours with no treatment, the sore may be growing. The more hours each day that you have a disc in place, the faster the sore will heal. The sooner you start treatment of a new sore, the quicker it will heal and the fewer Cankermelts will be needed. 1. Place a dry Cankermelts disc on the sore using your fingers or the tip of your tongue. It will stick, weakly at first, increasing over time. 2. Let your cheek or lip relax to normal position. The disc may touch your teeth or gums which will hold the disk against the sore. 3. The disc may slowly stick to your teeth or gums and it may be pulled off the sore when you move your mouth. This is okay because, while stuck to teeth or gums, the disc will still frequently touch the sore. 4. The disc will slowly dissolve. When it is nearly gone, put in a fresh disc. Continue until 8 hours after you last feel the sore to prevent relapse. 1. Use the sore spot on your tongue to press a Cankermelts disc against the nearest tooth (or gum or denture) until it sticks (about 2 minutes). If the disc is dry, start by placing it on the sore with your fingers. 2. Once the disk is stuck to the tooth or gum, it may also be stuck to your tongue. Carefully pull your tongue off the disk, leaving it stuck to your tooth. 3. Frequently touch the sore spot on your tongue to the disc. Heal it before it hurts: To heal a new sore before it begins to hurt, start treatment as soon as you detect the coming sore and keep a Cankermelts disc on or opposite the sore for at least 16 hours per day until 8 hours after you last feel the sore. When to use: You may use Cankermelts during any activity, including showering, exercising, and sleeping. To last longer, you may use two discs at once, one on top of the other. Eating: Use for at least 20 minutes before a meal to reduce pain from eating. You can eat with a Cankermelts disc in place. It is okay to swallow the disc. 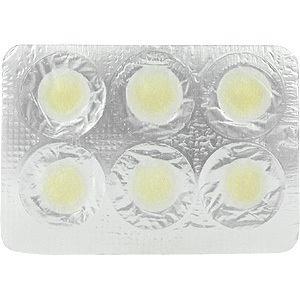 Use with braces: Apply a dry Cankermelts disc to the sore and let it press on your braces. The disc will soften and settle into the braces and then pull away from the sore. Cankermelts will not harm your braces and will completely dissolve out of them in 3 to 8 hours – sooner with brushing. Use with dentures: Soften a Cankermelts disc in your mouth and then hold it against the denture or gums until it sticks, as close as possible to the sore so the medication released from the disc will spread to the sore. Preventing new sores: Use Cankermelts for 6-12 hours after getting a cut from braces or biting your lip or cheek to prevent a canker sore from forming. Some people use Cankermelts every night while sleeping to prevent sores from forming. Cankermelts-GX is an all natural product that is safe to swallow. Average ingredients per disc: 30mg Glycyrrhiza (licorice root) extract (includes 1.4mg glycrrhizin), hydrophilic gums and potassium. Does not contain: Fat, salt, gluten, artificial flavours, artificial colours, preservatives, products of nuts, corn, wheat, rice, grain, soy, egg, fish, shellfish, milk or yeast. Jeff Haley, Chief Scientist and founder, Orahealth. Being a canker sore sufferer all my life, I tried every product available and nothing worked. I finally decided there had to be a better wat to reduce my pain and I began conducting scientific research in the field of canker sores. I discovered that canker sores are hereditary, not contagious, and most importantly, are healable. I began testing different ingredients and formulas. After two yours of testing over 250 different formulas, I developed Cankermelts-GX. 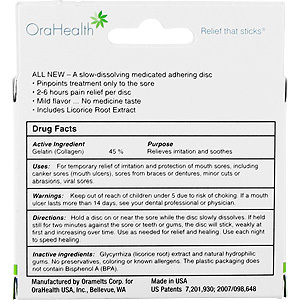 This product is unlike any other canker sore medication on the market today. It actually heals canker sores! During my two years of research, I learned about early studies of GX, an etract of the root of the Glycyrrhiza plant, which suggested it could be an effective treatment for healing canker sores. Unfortunately, in it's previously known forms, it was difficult to use properly and required a very high dose to be effective. So I set out to invent an easy and effective way for canker sore sufferes to use GX. After months of research and development work, I invented and subsequently pantented Cankermelt discs. This unique disc is safe and east to use and allows the focused delivery of a minimal amounth of Gx direcltly to the canker sore. 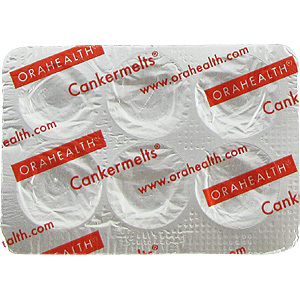 Cankermelts-GX is the fastes way to heal canker sores. Our company is confident that when used as directed CAnkermelts-GX will heal your canker sores in 1-5 days! These work. They don't sting, and there's only a very slight taste of licorice. Soothing and healing. I have suffered with horrible canker sores off and on my whole life, and recently I got a really bad one right before I was going to go out of town for the weekend for a wedding. I didn't want to be miserable for the trip, so I looked online everywhere for remedies and found this. They don't sell them where I live, but my family met me from Seattle for the wedding and brought me some. I put one on the sore and the pain went away immediately! One tablet can last on the sore for hours, and when one was almost melted I put another one on top. I had no pain for the wedding, and the sore was almost healed by the end of the weekend. It took about 4 days like the box said! I definitely recommend trying this! How many Cankermelts should I use each day? Each Cankermelts disc will dissolve over a period of 2 to 6 hours depending on the flow of saliva and level of local mouth activity. If applied at the onset of a canker sore, one to three discs may be enough to heal the sore. If applied to a canker sore in an advanced stage, you may need to use more discs over a longer period of time. Why do Cankermelts vary in size and shape? Cankermelts are manufactured in various sizes and shapes to accomodate different locations in the mouth. What if the disc sticks to my teeth or gums or denture but not the ulcer? This form of treatment is equally effective provided the disc is close to the ulcer or the ulcer frequently touches the disc. What if I can't make the disc stick in place? For best results, press the disc with your tongue, lip, or cheek against your teeth, gums or denture until it sticks (about 1 - 2 minutes), or remove it from your mouth, let it dry, and place it with your finger or tongue on soft tissue. Can taking too much licorice extract cause health problems? Yes, if it is an extract that includes glycyrrhizin. In high quantities, adverse side effects from GX may include sodium retention, potassium loss, headaches, swelling and high blood pressure. Cankermelts-GX has such a small amount of glycyrrhizin that a person with typical sensitivity would have to consume more than 750 discs in a 3 day period to be at risk of potentially harmful side effects. Why don't Cankermelts taste like "licorice"? Most "licorice" candy is flavored with anise and contains little or no licorice extract. The time release technology used in Cankermelts releases very little flavor at any one time; in fact most users reported a taste so subtle it did not interfere with other flavors during food consumption. Will Cankermelts stain my teeth? No. The ingredients in Cankermelts will not stain teeth, dentures or porcelain restorations. However, like tea and coffee, GX may, over months of daily use, stain white composite fillings. Are ordinary mouth ulcers contagious? No. Unlike cold sores, which are caused by the Herpes virus, ordinary mouth ulcers (canker sores) are not contagious. A tendency to canker sores is genetic and inherited, or may be related to phychological stress or certain foods. Cankermelts GX is shipped in a discrete, unmarked package. Orders are processed immediately and usually take about 3 to 5 working days to be received. We do ask that you try it for 2 to 3 weeks to feel the full effects. Any information received is used only for order processing and shipping purposes. Your information, such as e-mail address, will never be disclosed to a third party.